The World of Althéa: Crazy Daisy Fame! When I went to pick the mail up this morning, I saw a picture of one of our rabbits staring up at me. 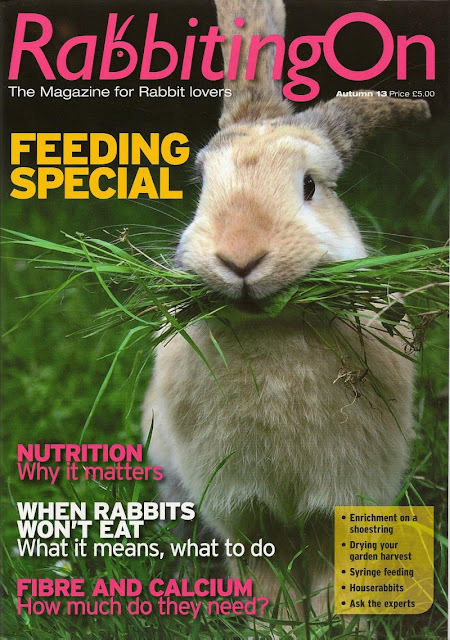 It was "Daisy" and she had made it to the front cover of the UK magazine called "Rabbiting On" produced by the Rabbit Welfare Association, which my wife and I subscribe to. If you look close enough, Daisy is also the rabbit on the right in my blog's logo image. The small black bunny on the left is "Bud", her bonded mate. This magazine only comes out four times a year and so to have Daisy's photo on the front cover is a real privilege for us, and she has done us proud. I took the photo in question in the spring 2008, just after we got her and is when she was going around the garden picking up all sorts of grass and using her own fur to make up a nest. So while this photo is on an autumn "feeding special" magazine, I can safely say she was gathering the grass for other reasons than to simply eat. It was this frenzied grass gathering exercise, however, that helped to solidify the "crazy" part of her nickname. This is only a quick update this week as I am continuing to write conversations and so cannot say much without it being a "spoiler". However, I can say that I am still making progress, and that once these conversations are done, I will be left with only some "encounters", "treasure placements" and a couple of "dungeons" to finish. The end of this first module is definitely in sight ... and I am so eager to get it to Beta that it hurts.